The Enterprise is headed to Sarona VIII for some shore leave, but Picard has gotten a headstart by fencing with a lieutenant. Though he loses the first point he wins the second–twice, as time seems to repeat itself in an eerie deja vu effect. The bridge confirms the temporal anomaly, and they pick up a distress signal from a Paul Manheim, reknowned wibbly-wobbly timey-wimey tinkerer who left Earth fifteen years ago to experiment with multiple dimensions and nonlinear time. 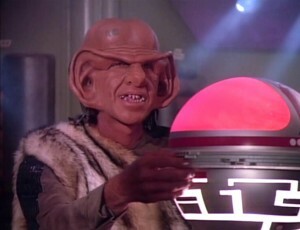 Picard reacts strongly to news of Manheim. 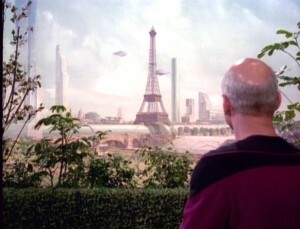 Because he’s got a few hours to kill before the ship reaches Manheim, Picard goes to the holodeck to recreate Paris twenty-two years earlier. There he runs into a woman waiting for a man who never shows. 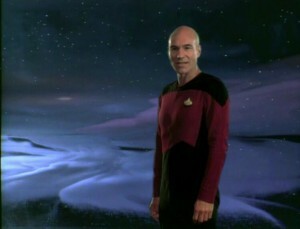 She asks Picard why her beau did not come, and Picard tells her it was because of Nazis he was afraid. He then chastises himself for indulging in such fantasies and goes back to the bridge.